COOK chops in hot oil in large skillet for 4 minutes on each side or until cooked through. Transfer to plate; cover and keep warm. ADD apples, onion and water to skillet. Bring to boil. STIR in stuffing mix. Top with chops; cover. Remove from heat; let stand 5 minutes. 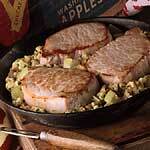 Apple Pork Chops Skillet: Prepare as directed, omitting onion, using 2 apples and substituting apple juice for the water.